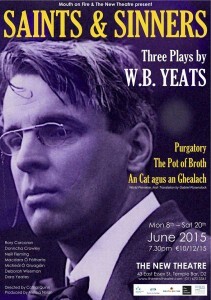 Micheál O'Gruagáin will play The Blind Begger in 'An Cat agus an Ghealach' as part of Mouth on Fire Theatre Company's SAINTS & SINNERS collection of W.B Yeats plays. It is a brand new translation of 'The Cat and the Moon' into Irish by world renowned poet and translator Gabriel Rosenstock. At The New Theatre Mon 8th - Sat 20th June @ 7.30pm For more details visit www.thenewtheatre.com or Mouth On Fire's Facebook page here.